In concert with the 2014 ISAT convention we held a Master’s Challenge only event in order to select the Texas Chapters climber to represent us at the 2015 ITCC to be held next March in Tampa, Florida. This competition was necessary due to the decoupling of the ITCC from the annual ISA conference and the short led time between the ISAT conference and the 2015 ITCC made it impractical to hold a full TTCC. The competitors were selected based on their performance at the TTCC event held last May in New Braunfels. Four of the five climbers qualified participated in this event and a 2015 TTCC Champion was determined in the tree. The four competitors were 2014 Champion Vicente Pena Molina, Miguel Pastenes, Otoneil Sanchez and Jimmy Prichard. Miguel prevailed and impressed with his nearly flawless climb of a huge Pecan in Waco’s Cameron Park. Second place was earned by an excellent climb by reigning Champ Vicente Pena Molina. Otoneil Sanchez won third place and Jimmy Prichard was fourth. Congratulations to each of these great climbers. Any one of them would have represented us well at the ITCC. Special congratulations are due to Miguel Pastenes as he climbed his way to an unprecedented 7th TTCC title! His name will be added once again to the Steve Houser Award of Excellence aka The Houser Cup. Miguel's climbing is a joy to watch as he manages to make a difficult job look effortless. Thank you to all the 2014 competitors, judges, technicians, sponsors and exhibitors! "Let's Gather at the River"
Throwline -- tests a climber’s ability to install a climbing line high in the tree. Belayed speed climb -- hand over hand climbing to the top of a 50 foot tree. This is a pure power house event. Footlock -- like climbing the rope in gym class, only the rope is 1/2″ thick and there are no knots to grab. This is a balance of skill, calmness, agility and pure strength. See a video here. Aerial rescue -- a 150 pound sand-filled dummy is set in a tree in a simulated injury -- rescue scenario. The climber must assess the situation and safely bring the injured climber to the ground. See a video here. Work climb -- We set four stations in the tree, climber’s time starts when they are already in the top of the tree and finish when they are on the ground and unclip from their gear. See a video here. hand bell station -- climbers simply ring a bell with a hand saw carried on their harness. pole saw station -- climbers use a pole saw (already hanging in the tree) to ring a bell. limb toss -- using a short piece of pvc pipe that simulates a branch, climbers, toss the limb into a target painted on the ground (as if to avoid dropping a branch on a customers prized rose bush!). limb walk -- a plum-bob is hung from the end of a long low branch. Climbers must climb out to the end of the limb and ring a bell without putting too much weight on the limb. You have to put all your weight in the saddle vs. standing on the limb. If you put too much weight on the limb, the plum-bob will drop and set off a buzzer! The top 5 finishers from the preliminary events quality to compete in the Master's Challenge where the winner earns the right to compete in the international event in Milwaukee later this summer. The Master's Challenge combines all the skills from the preliminary rounds into one big climb. For those of you who follow the International Tree Climbing Competition, you will recognize Jared, as he is the 2009 ITCC champion and the 2011 North American Champion. He has been a regular in the ITCC finals since 2001. Jared and Gary are very well schooled and experienced in all Tree Climbing techniques. Gary was a perennial Western Chapter Champion before Jared finally was able to beat his father, and extend the family legacy at the ITCC. Gary is currently on the ITCC rules committee . He has been climbing trees since he was a boy in Hawaii, climbing for coconuts!! I am sure that all who attend will learn something new regardless of experience. This is a 2-day event with all five preliminary events starting on Friday. Six climbers per group will rotate through events and groups will be pre-drawn; each group will draw numbers for starting order. Climber rotation will change with each event. Saturday events may run ahead of schedule depending on the progress of preliminary events on Friday. If we finish Friday, the Master’s Challenge may start earlier on Saturday. PLEASE NOTE: NO WALK UP ENTRIES WILL BE ACCEPTED. ONLY PRE-REGISTERED COMPETITORS WILL BE PERMITTED TO COMPETE. The Texas Tree Climbing Championship is a lot of fun, but in order for the day to go smoothly and safely, it is important that everyone agrees to any and all rules. If you are mailing in your entry and waiver forms, please be sure they are completed in full, and are legible for staff to read. EVENT INFORMATION: The competition takes place on Friday and Saturday, May 16th and 17th. You must attend the mandatory meeting on Friday, May 16th at 8:00 a.m. sharp at Cypress Bend Park. If you experience difficulty arriving to roll call on time, or feel that there will be an issue with arriving on time, please call Kevin Bassett (972-877-0358) with a valid reason (emergencies only). Time is critical to running an efficient competition. If you are not present for roll call, you will be disqualified and your entry fee forfeited. If you are not present with your rotation group when you name is called at any individual event, you will be disqualified from that event. GEAR INSPECTION: You must bring all gear you intend to use, as it will be subject to inspection at 8:00 a.m. sharp on Friday, May 16th. You will have until the start of the competition (10:00 a.m. on Friday, May 17th) to replace any unapproved equipment. All equipment for life support must meet ANSI standards. Sharing equipment is allowed, but not recommended, as you will be divided into rotation groups and will be expected to stay with your group. UNDERSTANDING RULES: Rules of the competition will follow the 2013 International Tree Climbing Championship standards and regulations published by ISA as closely as local restrains allow. They are available online at http://itcc.isa-arbor.com/home.aspx. It is the contestants' responsibility for his or her own safety to know the rules. You will be allowed to ask questions about rules during the mandatory meeting, however, since the rule book is available to you before the competition, and since time is pressing during competition set up, please be sure any and all questions are not already clearly explained in the ITCC rule book. If you cannot access these rules online, please call Kevin Bassett (972-877-0358) at least 3 weeks prior to the competition. COMPETITOR DETAILS: The Texas Tree Climbing Championship welcomes all of those whom are interested in competing, but since the winner of the competition will represent the Texas Chapter at the International Tree Climbing Championship, only Texas residents can be declared winner. Those who reside outside of Texas can enter to compete, but no matter what they place in the preliminary events, they will not be permitted into the Master's Challenge. All scores for out-of-state competitors will be held separately of the Texas resident competitors. The Texas Chapter encourages and gladly welcomes any and all women to compete in the Texas Tree Climbing Championship. All women competitors will be held to the same standard of individual events as male competitors. WINNERS: The winner of the 2014 Texas Tree Climbing Championship will have airfare and hotel paid for to attend the 2014 International Tree Climbing Championship (to be held on August 2nd and 3rd, in Milwaukee, WI). If the 2014 winner is not able to attend the ITCC, then the second place winner will be granted permission to represent the Texas Chapter, with airfare and hotel paid for. You must be a member of the International Society of Arboriculture (not just Texas Chapter Member) to compete at the International competition. All declared winners that are going to compete in the International Tree Climbing Championship should be aware that our Texas Chapter rules may vary slightly from those of the International Championship. The ISAT is pleased to announce the 2013 ArborMaster Climbing Kit Prize Package for the Texas Tree Climbing Champion. The package is intended to help equip the ISAT Chapter representative for the International Tree Climbing Championship (ITCC) Competition. The state’s best professional tree climbers will be showcasing their skill and agility at maneuvering in the trees. The tree climbing competition simulates working conditions of arborists in the field. Competitors perform five different events during the preliminary round in which each event tests a competitor’s ability to professionally and safely maneuver in a tree while performing work-related tree-care tasks efficiently. The competitors with the highest scores during the preliminary events move on to compete in the Master’s Challenge on Saturday in Landa Park. The Stock Speed cutting event will be sponsored by Stihl will be held on Saturday, May 17. 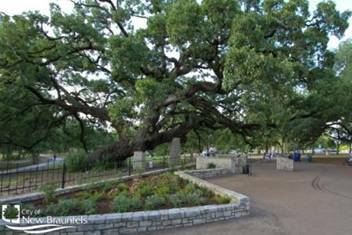 The winners from the Texas Championship are named the state champions and earn the opportunity to go to Milwaukee, Wisconsin August 2-3, 2014 for the International Tree Climbing Championship. For More information about the Texas Tree Climbing Championship please visit www.isatexas.com. Preliminary competition events for the TTCC will be held on Thursday & Friday in Cypress Bend Park (503 Peace Avenue), a popular spot for kayaking or floating the river. The Masters Challenge on will be on Saturday, May 17 in Landa Park (164 Landa Park Drive). Also onsite will be various green groups that you can visit with including: Native Plant Society of Texas, Lindheimer Chapter, Ravenstar (kids outdoor education), Ladybird Johnson Wildflower Center, Friends for Landa Park, Parks & Recreation department, Public works recycling, Library, NBU (landscape, mulch, and tree rebates), and Texas A&M Forest Service Firewise and Oakwilt. Landa Park offers many family friendly amenities like picnic tables under the shade of giant oak trees or you can ride a miniature train that chugs around the 51 acre park. 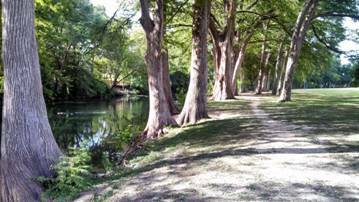 An excursion on a paddle boat is one of the best ways to see the Comal Springs and Landa Lake. Or take in a round of miniature golf, relax at the playground or enjoy the unique flora and fauna found on the Panther Canyon Nature Trail. Don’t forget to enjoy the walking William and Dolores Schumann Arboretum tour with over 50 species of trees! This unique event is held in conjunction with the Educational Tree Fair on Saturday during the event.